More Jantastic and an even better long run! 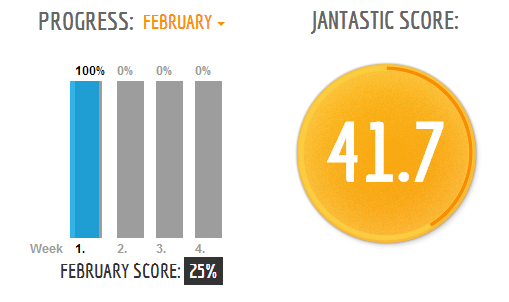 So Jantastic moves on and 3 of the 4 weeks of February are out of the way. Having used my Joker last week I’m still ‘just’ holding onto my 100% record. 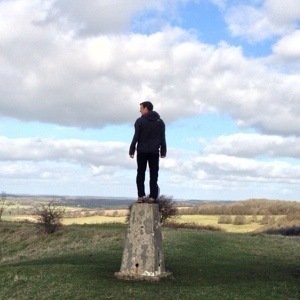 In preparation for today’s long run, myself and the lovely wife went for a walk along the South Downs Way yesterday up to the hill of Old Winchester Fort. The view from the top is stunning, we could see the Isle of Wight and New Forest in the difference. Becca couldn’t believe that this was only 20mins from our house! My long run this morning was a 20miler for the first time this year, and I was up at 6:30am to get it done and out of the way so that Sunday wasn’t defined by me having to spend 3hrs running. Four slices of peanut butter on toast and a cup of tea for breakfast and I was out of the door. 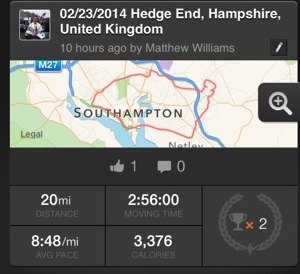 20miles later and I’d earned my sit-down shower! 2 miles further than last weeks and a good 15secs per mile faster. I didn’t have the same leg speed as I finished with last week, but I was still able to finish strongly as the mile splits below show. I’ve got a half marathon race at Silverstone next Sunday, but after that I have a couple more long runs to do before taper-time. I’m still unsure about sticking around the 18/20 mark or trying to creep up to 22miles before easing back in the last couple of weeks. I’m ahead of the curve for completing the distance, so I’ll wait and see how the half marathon goes, sub 1:40 is my goal after a half marathon debut of 1:44 last year. Guess I should do some speed work this week! Another week of Jantastic complete successfully, sadly I had to use my February joker to achieve 100% as due to a crazy work load and the hideous weather (we’ve lost 3 fence panels this week) I’d not been able to get out as much as I would have like. The only run I did other than my long run was squeezed in at 10pm as a 4 mile run home after dinner with friends. 4 miles directly after a steak dinner+desert+cake was an interesting challenge! Luckily, an easy week meant I was well rested for the weekend long run of 18miles. It was the same route as last week but in reverse, I also was going to make sure I’d fuel better before and during the run. 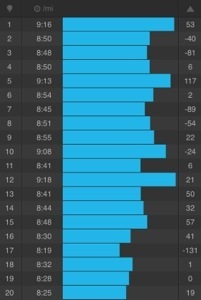 Last week if experimented with depleting my carbohydrate resources and simulating the infamous ‘hitting the wall’, and the end result was my worst long run ever! Luckily this week was notably easier, I even thought of tagging on another 2 miles to get up to 20, but was sadly running out of time. Instead, I aimed to finish strong and despite averaging 9:04 per mile, my final mile was a 7:30 and I still felt like I had more left in my legs. 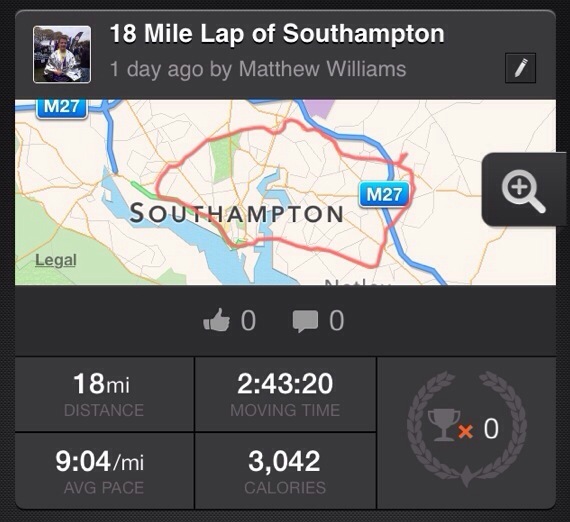 A complete change from last week and massively encouraging with only weeks to go before my next marathon. It re-illustrated to me the importance of having a fuelling strategy in training, both as practice for the race day and for simply getting you round on your training day! I regularly listen to the podcast ‘Marathon Talk‘ and this year decided to give their new year participation event ‘Jantastic‘ a blast. To keep it brief you set your targets for the three months of January, February and March, join a team and then log how you’ve done compared to those targets. 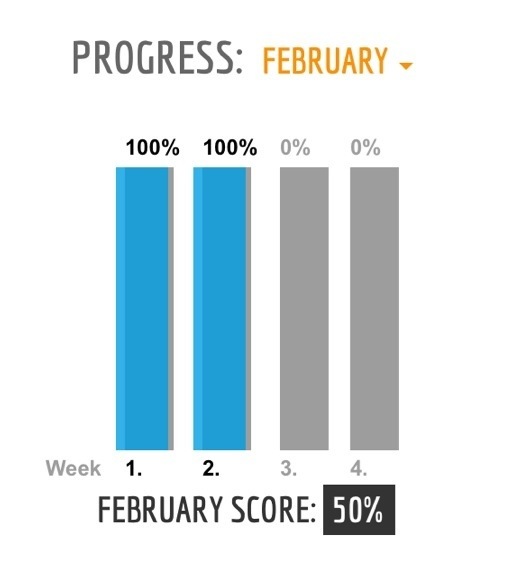 5 weeks in, January is completed and I’m into February and still on track for a 100% score. March – As above but with a prediction of timed finish for one all out run/race over a set distance. The closer you are to your estimated time, the better you know your own body. 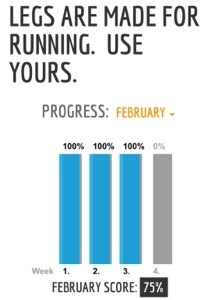 I’ve not set this yet, but will be picking the Silverstone Half Marathon in the first week. It’s such a simple concept, but a great little way of making yourself accountable for yourself! In 5 weeks there have been over 185,000 runs logged via the website. I’m confident a few thousand of those at least would not have happened without Jantastic.